From the ground up, we are with you every block of the way. MegaWall™ MSE retaining wall systems offer versatility, reliability, and ease of installation to every jobsite, simplifying everything from project design and engineering to installation scheduling. Building on decades of wall manufacturing experience, MegaWall™ MSE combines easier planning, quicker installation and better durability to build superior retaining walls. Corrosion-Free - Fiber reinforced concrete eliminates reinforcing steel resulting in corrosion free blocks. Versatile Components - Four primary block types pre-engineered to be used in curved, corner, and straight wall applications. Aesthetics - Standard design is random Ashlar block. A wide variety of other designs are available on request. Durability - 6,000 PSI wet cast concrete provides resistance to freeze-thaw deterioration. 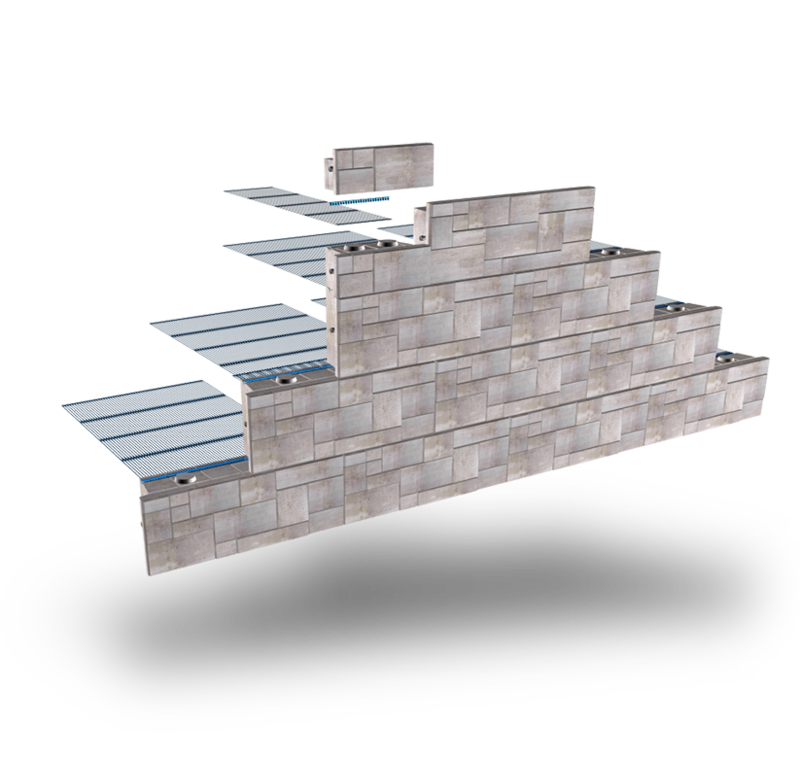 Top blocks provide an aesthetically pleasing finished wall, eliminating the need for cast in place. Grid connecting anchor system designed for rapid installation and quick connection of geo-grid to block. Geogrid or welded wire mesh soil reinforcement solutions offer the engineer and contractor flexibility. Alignment locks allow for rapid block alignment while retaining the block in a fixed position. Wire mesh connecting slots recessed to quickly accept and secure appropriate welded wire mesh. Time Saving- MegaWall™ MSE systems help you eliminate hassles or liabilities and focus on getting the job done quickly and efficiently. 13.75 SF vs 1 SF small blocks. Durability - The mechanically stabilized earth reinforcement utilized by MegaWall™, ensures a lasting connection and full support of the soil. Stability During Construction - Facing unit with sufficient mass to resist installation forces. Bracing and clamps are eliminated. Sustainability - The system is maintainable for long term sustainability. Wet cast concrete provides excellent durability against freeze thaw. Variety of Applications - MegaWall™ can be utilized in a variety of applications within the Residential, Commercial and Transportation industries. Manufactured to the rigid standards of the Oldcastle quality control program at Oldcastle facilities around the country.